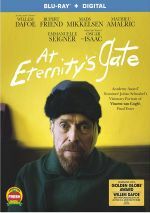 An unusual form of biopic, 2018’s At Eternity’s Gate offers a look at the life of Vincent van Gogh (Willem Dafoe). Set in the late 19th century toward the end of van Gogh’s life, we find the Dutch artist as he goes through self-imposed exile in France. While he continues his work, van Gogh struggles with mental issues and other concerns such as an occasionally contentious relationship with fellow artist Paul Gauguin (Oscar Isaac). All of these factors lead van Gogh toward introspection along his final days. It’s unusual for a movie’s publicity to admit that the film makes up content - and refreshing, too. This statement gives us a hint that Gate will be more impressionistic than the average biopic. That frees your friendly neighborhood critic from the usual nagging about factual inaccuracies. This means a review can focus more purely on the quality of the film itself. On those grounds, Gate works fairly well, though as implied, one shouldn’t expect it to offer a clear, concise biographical exploration. That wouldn’t be the case anyway, since the movie restricts itself to the end of van Gogh’s life, but the loose manner in which it tends to depict events adds to the abstract view of its subject. At times, these choices can frustrate, mainly because Gate can feel stuck in neutral. We get long scenes of van Gogh as he wanders through nature, and these don’t seem especially compelling. Nonetheless, the way Gate focuses on impressions over concrete content suits the subject and gives us an intriguing emotional perspective. The film manages to out us “inside” van Gogh’s head in a manner that exceeds the usual biopic and creates a better understanding of the artist. Dafoe’s Oscar-nominated performance helps as well. Given that van Gogh died at 37, the 62-year-old Dafoe is far too old for the role, but he makes it work anyway. That’s partly because we don’t have a great cultural vision of van Gogh in terms of his age, but it’s also because Dafoe delivers such a rich performance. He conveys van Gogh’s personality and intense concerns without resorting to hammy or over the top shenanigans. Dafoe grounds the movie and adds to its impact. Though Gate doesn’t provide a totally consistent winner, it brings an engaging, effective drama overall. At Eternity’s Gate appears in an aspect ratio of approximately 2.40:1 on this Blu-ray Disc. I felt pleased with this strong transfer. Overall sharpness worked fine. A smidgen of softness crept into a handful of elements, but those instances didn’t trouble me. Instead, the majority of the flick provided solid delineation. The image lacked shimmering or jaggies, and no edge haloes materialized. As one would expect from a brand-new movie, print defects failed to mar the picture. In terms of palette, Gate opted for a mix of yellows and blues to reflect much of van Gogh’s art. These looked solid, as the Blu-ray reproduced them well. Blacks came across as dark and deep, while shadows seemed smooth and concise. Overall, the transfer worked nicely. No one anticipates a dynamic soundscape from a character piece like Infinity, and the DTS-HD MA 5.1 track matched my expectations. Music used the various channels well to become an active partner, and effects added a bit of life to the proceedings. Nature scenes broadened sonic horizons to a minor degree, as they brought us atmospheric information. Nothing I’d call memorable occurred, though. Audio quality seemed good. Speech remained concise and crisp, with no edginess or related concerns. Music fared best of all, as the score appeared lush and full. Effects lacked much prominence, but they remained accurate and dynamic enough. This became a “B-” mix. A few extras appear, and we get an audio commentary from co-writer/co-editor/director Julian Schnabel and co-writer/co-editor Louise Kugelberg. Both sit together for this running, screen-specific chat about historical elements and liberties, story/characters, cast and performances, sets and locations, photography and editing, music, and the depiction of art. My only complaint here stems from dead air, as Schnabel and Kugelberg go MIA a little too often. Nonetheless, that trait doesn’t become a substantial problem, and the commentary offers enough useful information to compensate for the gaps. Three short featurettes follow: Made By a Painter (2:37), Channeling van Gogh (2:16) and Vision of van Gogh (2:09). Across these, we hear from Schnabel, Kugelberg, co-writer Jean-Claude Carrier, director of photography Benoit Delhomme and actors Willem Dafoe, Rupert Friend and Oscar Isaac. These look at Schnabel’s approach to the material, cast and performances, and visual techniques. A few good nuggets emerge, but these remain promotional in nature. The disc opens with ads for Five Feet Apart and Ben Is Back. We also get the trailer for Gate. With a strong lead performance and an engaging emotional sensibility, At Eternity’s Gate provides a compelling film. We get a dramatic glimpse of Vincent van Gogh’s final years in a package that never panders. 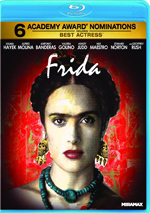 The Blu-ray offers very good picture as well as appropriate audio and a few supplements. Gate touches on its subject well.